The Stampotique Designers Challenge is asking for quick and easy Christmas cards. I thought about some cards I did last year, and remembered I have inky watercolour papers in the drawer waiting for more... so here's the result. Also posting for the SimonSaysStamp Wednesday challenge (Anything goes). 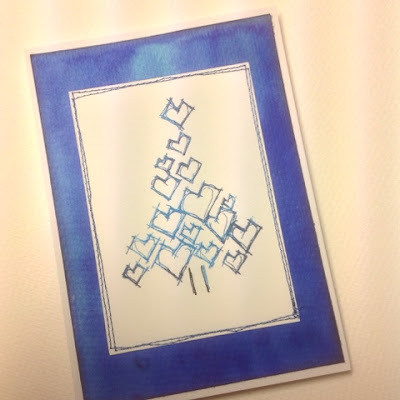 I wanted to use a Stampotique stamp for the challenge, but I don't have any Christmas ones... luckily it turned out that Daniels Hearts is extremely versatile! I bought this because I thought it would be great in all sorts of backgrounds, now I keep using it as a focal point. I used washi tape to mask of the sideparts of the stamp that I wanted to leave out. The tape can be reused lots of times --just remember to peel it off every time you stamp and place it back for the inking! All the stamping has been done with Distress inks and heat embossed with clear glossy embossing powder. The blue tree has been inked with Salty Ocean and touches of Chipped Sapphire. Since everything was out, I did a few. The white card is Crafty Individuals Satin card (european A6 size) cut in two. Then I wanted to try some other colours, after all I had the inky water colour also in red and green. No time at all, and I had done toppers for eight cards! The foot of the tree has always been doodled with Distress Markers. I finished the cards by mounting them on the inky watercolour and sewing around the toppers. I guess some would say that sewing is not quick and easy, but my sewing machine is always at hand (and sees more paper than fabric), and I can't think of a faster way to add a sophisticated finish to a project like this. 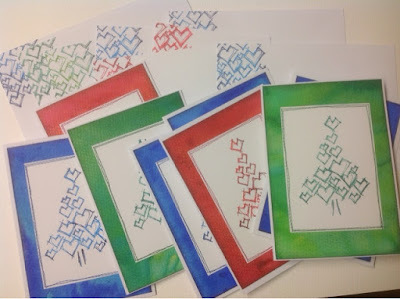 I used the same colours to stamp some mail art on the envelopes. I ADORE your design, Kristina! 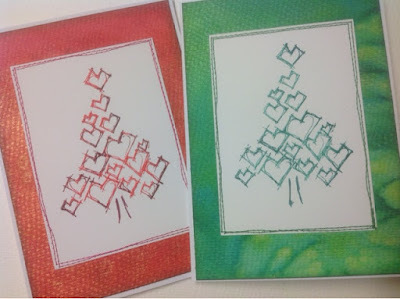 Hearts are a favorite motif of mine, but I'd never in a million years think of using this stamp to make a tree - BRAVO! 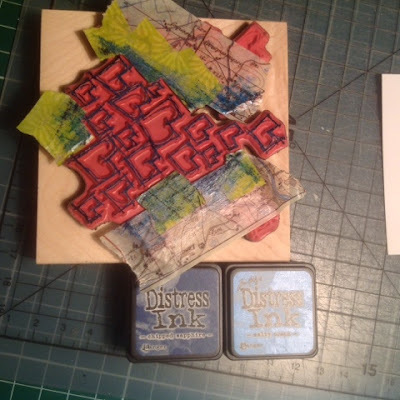 Thanks for sharing this with us at the Simon Says Stamp Wednesday challenge! Wow! Super effective use of that stamp! what a great idea, I wish I had thought of it !! Thank you for joining us for the Stampotique challenge.